The first known use of the noun ‘plague’ occurred in the 14th century, according to The Merriam-Webster. The word has Latin, Old High German and Greek roots, all of which point to tragedy, lamentation, and curse. In modern English, the severity of the word has become diluted somewhat; it is now also used to depict unwelcome, nuisance events or mild disturbances. But it is important not to be unmindful of the disaster, the destruction, the calamity – untold misery and suffering of countless people, that this word came to represent during certain periods of human history. It is, therefore, curious, to a chronicler of medical history, that the liability associated with the word ‘plague’ should come down to one rod-shaped (“bacillus“) bacterium, Yersinia pestis – a microbe stained pinkish red by the Gram’s Stain procedure (“Gram negative“), capable of growing in presence or absence of oxygen (“facultative anaerobe“), and responsible for the deaths of both humans and other animals. 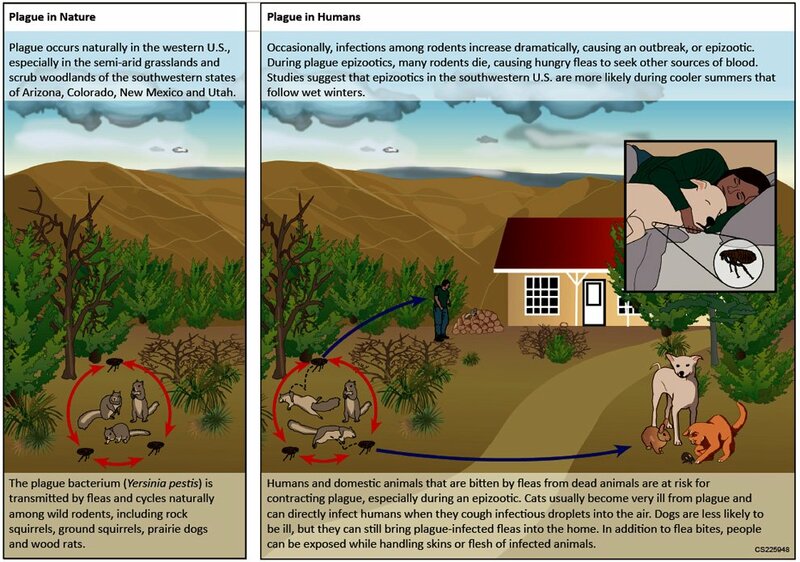 Both panels courtesy Public Health Image Library, CDC; left panel: blood smear that revealed the presence of Gram-negative Yersinia pestis plague bacteria. Note the characteristic bipolar, “safety-pin”-like appearance of the microbe. Photo by Dr. Jack Poland, 1975. Right panel: Yersinia pestis colonies on culture plate, grown for 48 hours at 37°C. Note tenacious nature of these colonies and their tendency to form sticky strands when touched by an inoculation loop. Photo by Pete Seidel, 2010. Yersinia pestis is primarily a rodent pathogen; in the nature, its life cycles between wild rodents (including squirrels, chipmunks, prairie dogs, voles, rabbits, wood rats and mice) and fleas that infest them and drink their blood. This relationship, called enzootic cycle, establishes a long term reservoir of the bacterium. Transmission to humans and other animals (such as wild carnivores, domestic pets, urban rat populations) primarily occurs by the bite of infected fleas. This phase of the life of Yersinia pestis is referred to as the epizootic cycle. There is some evidence that in between epizootic cycles, the bacterium can persist in the soil under natural conditions, for up to 24 days; the mechanism is not yet known. Humans are considered most at risk during an epizootic cycle. When the infected rodents start to die, the parasitic fleas look for new hosts. A direct flea-bite, or exposure to blood and bodily fluids of a dead, infected animal can transfer the bacterium to humans; dogs may carry the fleas on their skin, and cats get infected by eating an infected rodent. In addition, coughed-out droplets from an infected human patient or cats (which are, unfortunately, rather susceptible to plague) may be accidentally inhaled by other humans and animals. Once in the body, Yersinia pestis is generally rapidly destroyed and eaten by cellular defenders of the immune system. However, a few may survive by hiding inside one of those immune cells, called a macrophage. The macrophages ingest the bacteria, but may not be able to kill them; in that protected intra-cellular environment, Yersinia pestis grows in number and collects a protein coat. Later, when they burst out of the macrophage, the coat protects them from attacks by other immune cells, and they quickly spread to the lymph nodes in the neck, the armpit and the groin. As a result, the lymph nodes swell, become painful and hot to touch, and may bleed internally, giving a black, bruised appearance (known as ‘buboes’); the condition is called Bubonic plague. Photo courtesy Public Health Image Library, CDC; Bipolar staining of a plague smear prepared from lymph aspirated from an adenopathic lymph node, or bubo, of plague patient. Photo by Margaret Parsons, Dr. Karl F. Meyer, 1965. As a result of untreated Bubonic plague or via direct entry through skin (say, a wound), the bacterium spills into the bloodstream in a matter of days, spreading to skin, liver, and spleen. This is known as Septicemic plague. One major complication of septicemic plague is known as DIC or disseminated intra-vascular coagulation, a pathological condition in which blood clots randomly inside blood vessels in the body, depleting clotting factors (which subsequently causes abnormal internal bleeding) and preventing normal blood flow to organs (which may lead to organ failure). As a consequence of untreated septicemia, or via direct inhalation of infectious droplets, the bacterium infects the lungs causing severe respiratory distress, lung failure and shock. This form, called Pneumonic plague, is the most difficult to treat and is uniformly fatal. As one can imagine, plague is a serious disease, and without prompt identification and institution of correct treatment, can lead to a quick and painful death. However, the plague bacterium is still susceptible to commonly available antibiotics active against Gram-negative bacteria (such as polyketide “-cycline”; aminoglycoside “-mycin”; chloramphenicol; fluoroquinolones “-floxacin”; sulfonamides “sulfa drug”; and so forth). Substances that can interfere with the bacterium’s ability to cause disease. Now, having learnt about Yersinia pestis and its role in one of deadliest diseases known to mankind, throw your mind back to the times when the medical interventions were not available. Those times were not pretty. However, the scourge of plague – by virtue of its destructive nature – has occasionally turned the tides of history, significantly impacting the development of human civilization. We shall talk more about it in the next segment. Stay tuned!